Do you love the Starbucks iced vanilla latte? Want to make it at home? 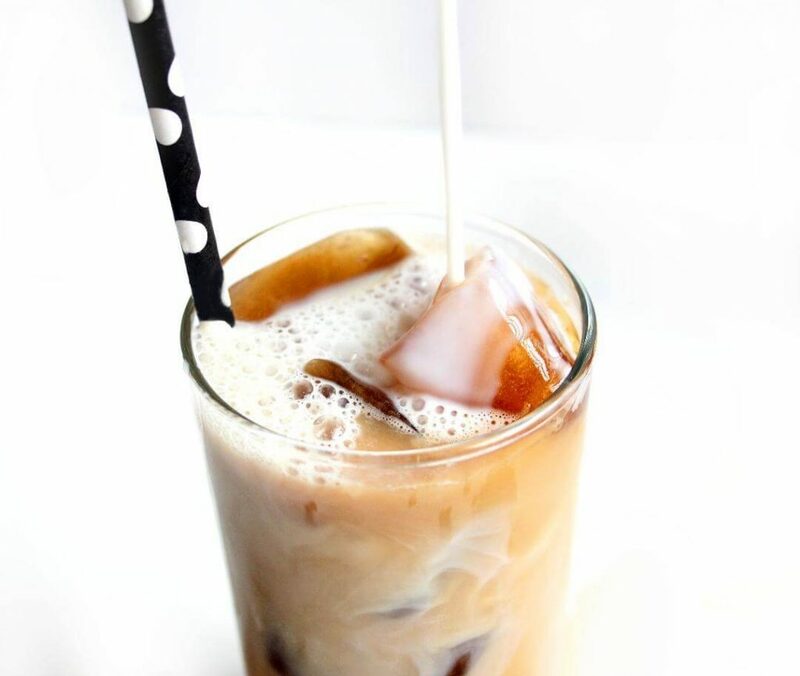 Let me show you how to make this easy iced vanilla latte recipe for a fraction of the cost! You know what’s funny to me? I make this iced vanilla latte at least once a week and I am just now sharing it with y’all. 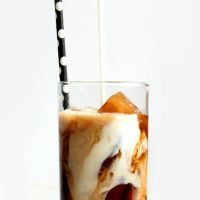 I love this copycat coffee drink and it’s super easy to make at home. If you are a coffee lover, you have to add this one to your routine. 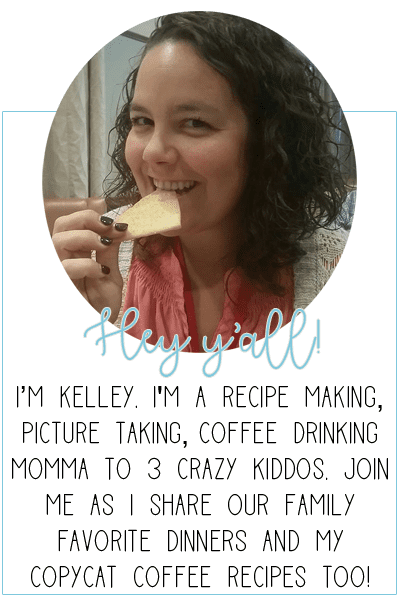 I know that you will make it as often as I do once you snag the recipe. What does an iced vanilla latte taste like? 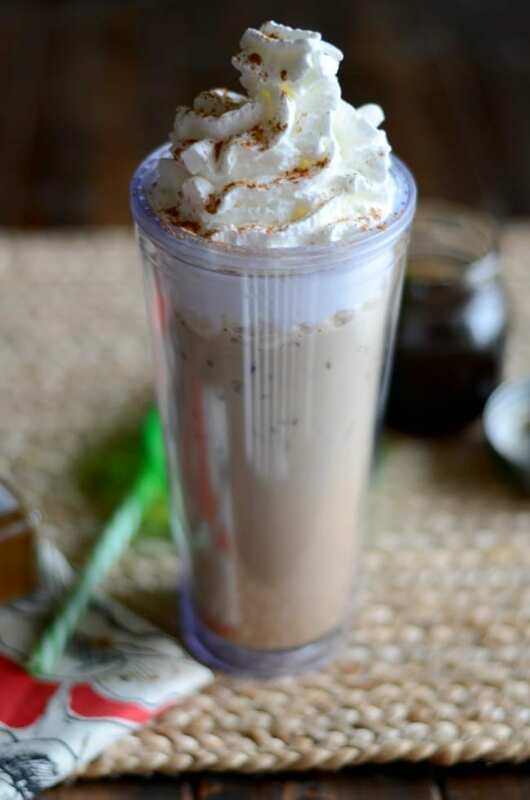 This easy coffee recipe is a great morning or mid-day pick me up. It’s also great as a dessert drink if you can have an evening coffee without keeping you awake. It’s silky and sweet and perfect for the coffee lover. Plus, it’s a Starbucks copy cat that can save you money by making it at home. 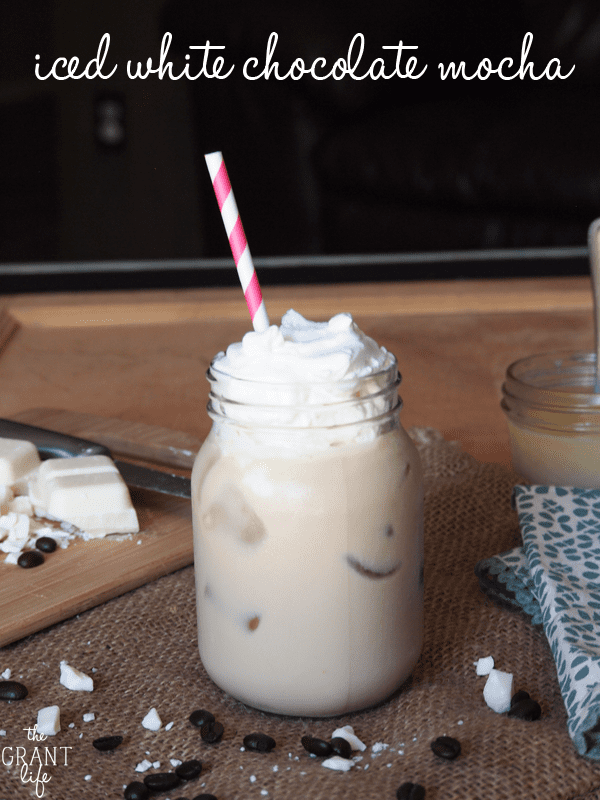 My favorite thing about this copycat coffee recipe is that once you have the ingredients on hand, you can easily whip up this vanilla latte in about 5 minutes. And you can also makes drinks like white chocolate vanilla latte, vanilla latte, and vanilla iced chai latte. What’s in an iced vanilla latte? A traditional latte is made with espresso and steamed milk. 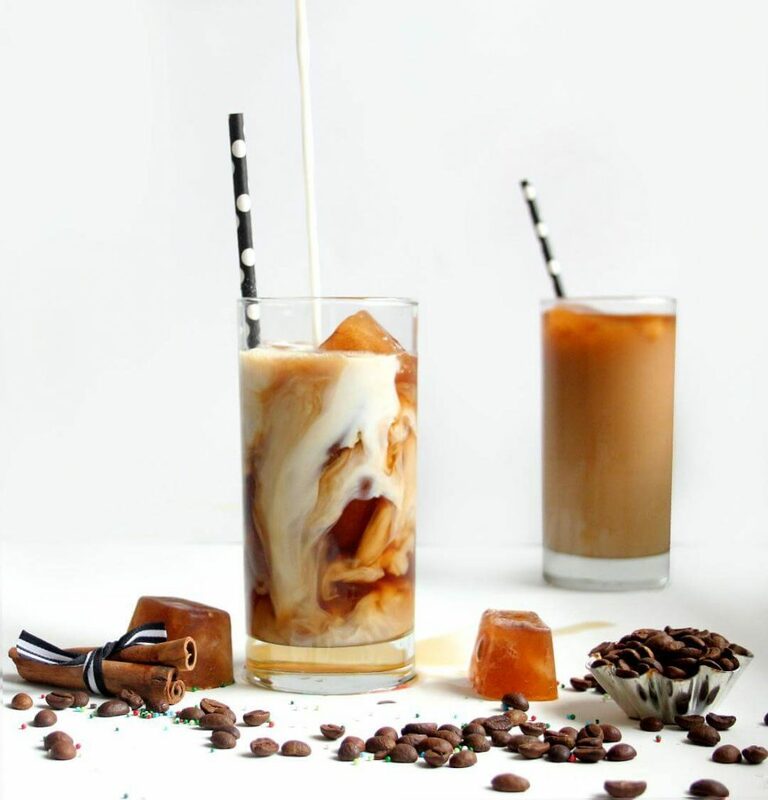 When it comes to an iced latte the recipe is a bit different. You still use espresso and milk but since you don’t need it hot you don’t have to steam your milk. You also don’t need to use hot coffee or espresso here either. You want a good strong coffee such as a medium roast for this recipe. A medium roast coffee has a smooth taste but is higher in caffeine than a light roast. Cold brew coffee is another great option here. You can also use espresso – fresh or instant. I don’t have an espresso maker so I use instant espresso for my coffee drinks. I like the Medaglia D’Oro Espresso brand but any instant espresso will work. When it comes to the vanilla syrup, you have two options – homemade or store bought. I recommend homemade vanilla syrup whenever possible. It allows you to customize the sweetness and has less preservatives in it. Plus you can make as big of a batch as you’d like. If homemade is not an option, I love Torani vanilla syrup. It has a great flavor and can be found at most stores. You can also use vanilla extract if needed. The last ingredient that you need is milk. 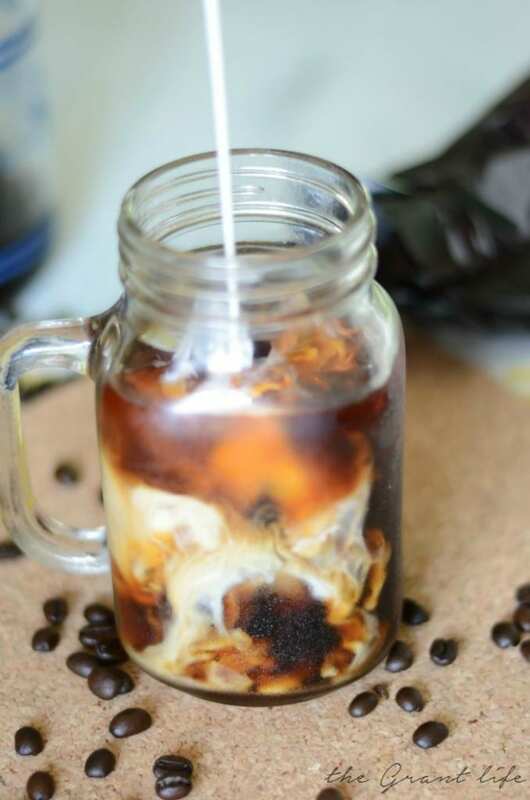 You can use any kind of milk for this iced vanilla latte. I enjoy using almond milk in my coffee drinks, but any kind of milk works. While this drink sounds fancy, it’s really easy to make. Once you have all your ingredients, you will also need to grab a glass or mug, a spoon and some ice. 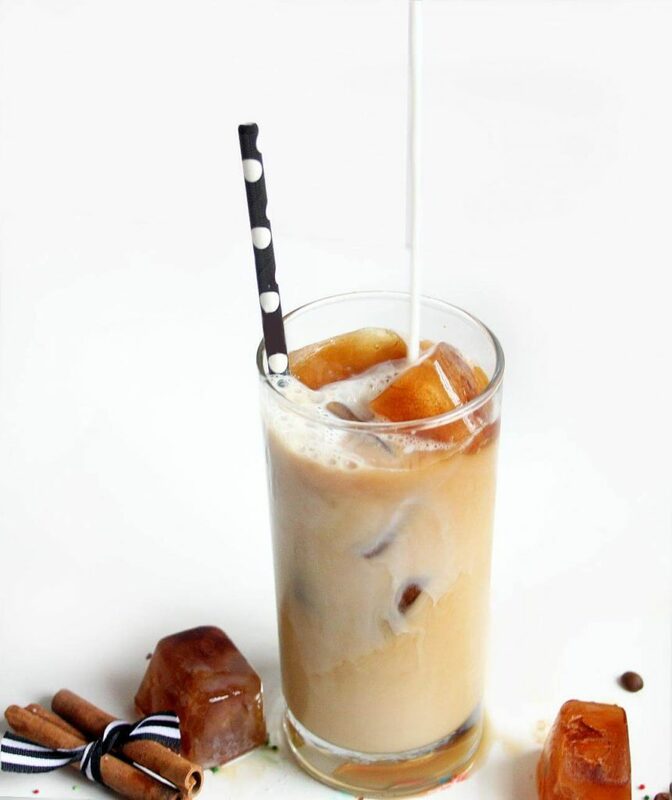 I love using frozen coffee cubes in my drinks so that the ice doesn’t water it down. You can use either. Start with your syrup. Add it to your glass and stir in your coffee or espresso. Then add your milk and mix it all together. Add your ice and you are done! Your iced vanilla latte is ready. A silky smooth iced coffee recipe. Prepare espresso or coffee and allow to cool. Instant espresso or cold brew coffee work as well. Mix the vanilla syrup into the coffee. Stir in the milk and add your ice.